Francis Newton Souza was born in 1924 in Saligaon, Goa. His father Joseph Newton died at the age of 24 within three months after Souza’s birth. In 1925 Souza’s mother shifted to Bombay with him. In 1937 he was enrolled in the St. Xavier’s High School, Mumbai. In 1939 he was expelled for drawing graffiti in a toilet, which he claimed he was correcting, but the priests did not accept his claim. In 1940, at the age of 16, Souza joined the Sir J.J. School of Art, Mumbai. In 1945 he received his Diploma in Painting. From 1940 to 1946 he made several attempts to participate in Bombay Art Society Annual Exhibition, Mumbai but he was constantly rejected. In 1945, when he was 21 years old, he was expelled from the Sir J.J. School of Art, Mumbai for supporting the Quit India Movement. In 1947 he married Maria Figuiredo and divorced her in 1964. In 1947 he founded the Progressive Artist's Group with S.H. Raza, K.H. Ara, H.A. Gade, S. Bakre, M.F. Husain and Tyeb Mehta. In 1947 he won the Bombay Art Society Award. In 1948, he was represented at an exhibition of Indian Art at Burlington House, London. In 1949, he along with the Progressive Artist's Group participated in the Art Society Exhibition. In July 1949 he left for England. From 1949 – 1955 he went through a difficult time in London. He attended the Central School of Art in London. In 1950 he was commissioned to paint murals by the Indian Commissioner, Krishna Menon for Indian Student's Bureau in London. In 1959 they were destroyed. In 1951 his daughter Shelly was born. In 1960 Souza lived with Liselotte Kristian and they had three daughters. He went on to Italy on an Italian Government Scholarship. In 1950, Menon arranged an exhibition of Souza’s work at India Home. In 1955, 1956, 1957, 1959 & 1960 Souza had one person shows at Gallery One, London. In 1954 & 1960 he had solo exhibitions in Paris and at Galerie Creuze. In 1962 he exhibited solo at Kumar Gallery, New Delhi. In 1963 he had a one man show at Taj Art Gallery, Mumbai. In 1964 he exhibited at Grosvenor Gallery, London. In 1965 he showcased at Dhoomimal Art Gallery, New Delhi. In September 1967 he received the Guggenheim Foundation Grant and he left for New York. In 1968 he had one man show at London Arts Gallery, Detroit. In 1968 he settled in USA. In 1954 Souza participated in a group exhibition at the Institute of Contemporary Arts, London. In 1955 he participated in Venice Biennale, Italy. In 1975 and 1976 he showcased at Arts 38 Gallery (the residence of his first wife) in London. In 1976 he exhibited at Dhoomimal Art Gallery, New Delhi and he had an exhibition organised by Look Gallery of Dubai at Hotel Intercontinental. In 1977 he exhibited at Commonwealth Artists of Fame in London. In 1982 he participated in an exhibition of Contemporary Indian Art organised by the Museum of Modern Art, Oxford and also at the Festival of India exhibition at the Royal Academy in London. Souza also participated at the Hirshhorn Gallery, Washington DC. In 1983 he showcased at Dhoomimal Art Gallery, New Delhi. In 1985 he exhibited at Pundole Art Gallery, Mumbai. In 1987 he took part in a group show at Coups de Coeur in Geneva. In 1988 at Indus Gallery, Karachi (owned by Ali Imam, brother of S. H. Raza). In 1989 he participated in ‘The Other Story’ at Hayward Gallery, London. In 1990 he exhibited at Centre for Contemporary Arts, New Delhi. In 1993 he exhibited ‘Souza 1940s – 1990s at Dhoomimal Gallery, New Delhi. In 1995 he showcased chemical paintings at LTG Gallery, New Delhi. In 1997 he exhibited at Bose Pacia Modern Gallery, New York. In 2000 he was exhibited at Pundole Art Gallery, Mumbai. In 1957 he was awarded John Moores Prize, Liverpool. In 1959 ‘Words and Lines’, F. N. Souza (an autobiography) the first edition was published by Villiers Publications. In 1998 he was conferred Kalidas Sanman, Government of Madhya Pradesh, India. 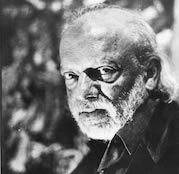 Souza passed away in 2002 in Mumbai and is now considered one of India's leading Modern Artists. In 2002, 2003, 2005, 2008, 2012 he was exhibited at Grosvenor Gallery, London. In 2003, 2004, 2005, 2011 at Kumar Gallery, New Delhi. In 2007, 2008, 2009, 2010 and 2013 at Lalit Kala Akademi, New Delhi. In 2011 and 2012 at Kiran Nadar Museum of Art, New Delhi. In 2004 he was showcased in ‘Ethos: Contemporary Indian Art’ in Singapore. In 2005 he was exhibited at Aicon Gallery, New York and Tate Britain in London. In 2007-2008 he was showcased at Province of Milan and in Bangalore, Kolkata and New York. In 2008-2009 he was exhibited in Mumbai, Spain, New York and Emily Lowe Gallery, Hempstead. In 2009 he was exhibited in Ontaria, Canada and in Mumbai. In 2010 he was showcased in several exhibitions in Mumbai, Chennai, New Delhi, New York and London. In 2011 he was exhibited at San Jose Museum of Art, San Jose and Museum Oglethorpe in Atlanta; In 2014 he was exhibited in Chennai and New York University, New York. In 2015 he was showcased at Gallery 7, Mumbai; ‘Francis Newton Souza: works on paper’ featuring 50 works on paper.